The CoExisT project has ended. Thank you everybody for all those great moments ! CoExisT was a live electronic band based in Toulouse, France. Email : coexist arobase smeuh dot org. Follow on SoundCloud. Some old playlists released under a Creative Commons Attribution-Noncommercial-No Derivative Works 3.0 Unported License. May 25th, 2012 Mutah plays "Music for a Galactical Kitchen Work : SIGFOOD2, stomach kick and bowel bass" during THSF 2012 at Mixart'Myris. 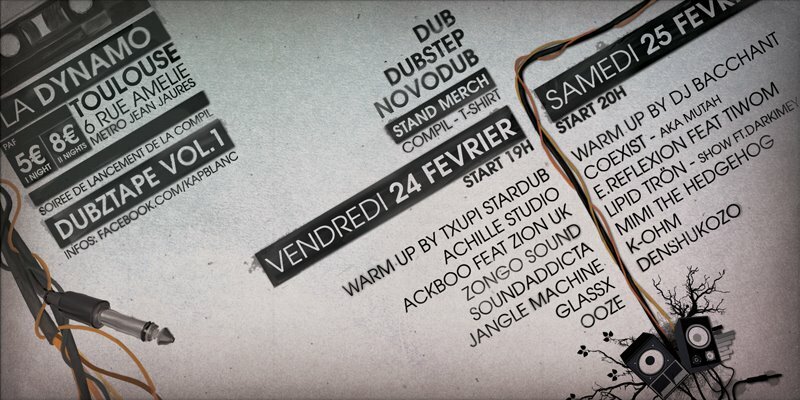 February 25th, 2012 La Dynamo, Toulouse, kapblanc DubzTape VOL 1 release party.